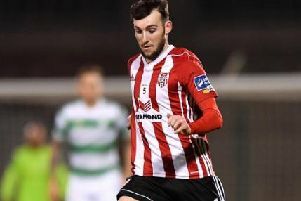 Derry City will be hoping to cause the shock of the round in tonight's Europa League first round first leg qualifier against FC Midtiylland who have done their homework on the League of Ireland outfit. DERRY CITY boss, Kenny Shiels believes his side's Danish opponents, FC Midtiylland have shown them 'respect' after sending representatives on a scouting mission last week in preparation for tonight's Europa League clash in Denmark. Indeed, FC Midtiylland manager, Jess Thorup sent a club representative to watch Derry lose 2-1 to league leaders, Cork City in Buncrana last Friday night and Shiels reckons they will have been impressed by what they witnessed. The Midtiylland man, however, clearly didn't do his geography homework as he based himself in Donegal Town for the duration of his short stay with the expectation it would be in close proximity to Derry City's Donegal base in Buncrana. Instead he found himself facing an arduous 170km round trip in a taxi from his hotel to Maginn Park and back. Shiels will no doubt be hoping he faced similar logistical issues on his return journey to Denmark leaving Midtiylland without an in-depth report and analysis on City's excellent performance against the SSE Airtricity League leaders. "They sent a representative over to the Cork game who was in the TV gantry filming our game against Cork," said Shiels, who has led Irish League clubs, Ballymena United and Coleraine into Europe. "That's testament to them. They have treated us with respect to go through the proper preparation and look at us as a team they will have seen we play decent. I don't think we played great football in the first half. But in the last hour we looked to be a good opponent for them and I'm sure they will have judged us on that." FC Midtiylland sent a scout to watch Derry City play Cork City at Maginn Park last Friday night ahead of tonight's Europa League first round first leg clash in Denmark.